The Kia Stonic is based on the Kia Rio, but it’s designed to be a more interesting SUV alternative – so should you choose this over the Rio? 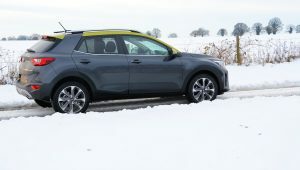 Kia has been very successful with sales of its Sportage SUV, but the smaller, ‘B-SUV’ segment currently accounts for over 1 million of sales across Europe, and this is expected to grow to 2.2 million by 2020, which is why Kia – and most other manufacturers – are desperate to bring cars in this segment to market. 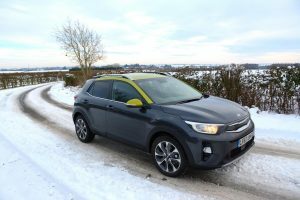 The Kia Stonic is based on the Kia Rio. However it looks a lot more fun and interesting – due to the mini SUV-style design and the two-tone styling. This applies to the outside, and to the interior, thanks to the coloured trim details. 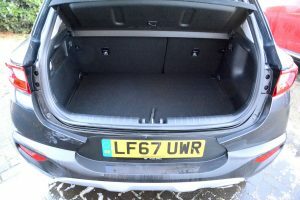 The boot isn’t huge, but there’s extra space under the false boot floor. Our test car came with the 3-cylinder, 1.0 T-GDi petrol engine and a 6-speed manual gearbox, front-wheel drive, and Kia’s ISG stop/start system. 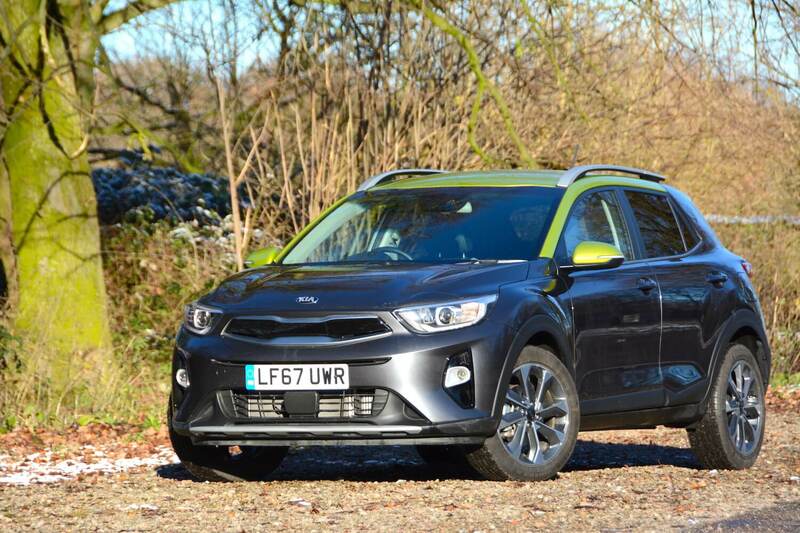 Although the Stonic shares the same platform as the Kia Rio, the Stonic feels more playful. It sits higher, it has more movement in the suspension (but not too much), and it has a comfortable ride. The 3-cylinder, turbocharged 1-litre petrol engine is revvy, and contributes to the Stonic feeling light. Although the Stonic has agile handling, there’s not much grip from the front tyres on damp roads – something that we’ve found with most Kias. You’ll see from the photos that the roads weren’t just damp when we tested the Stonic, but they were also covered in snow and ice. 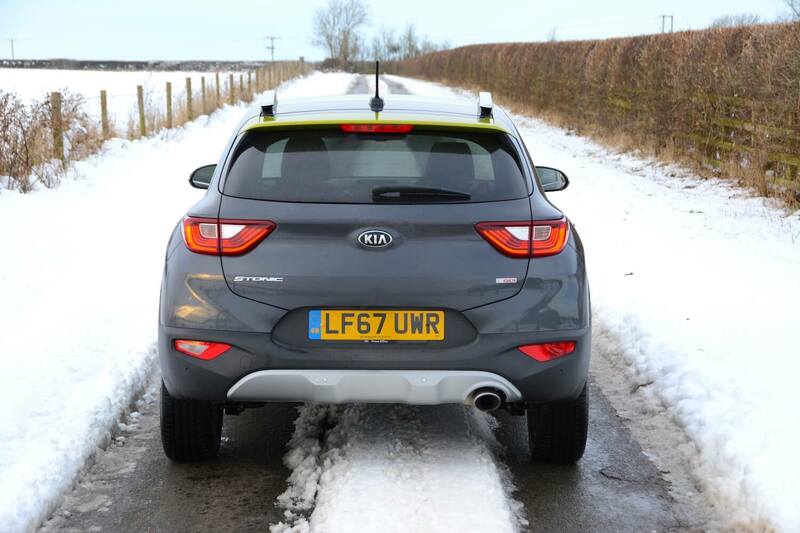 And no, the Stonic didn’t have winter tyres. The 3-cylinder, 1.0 T-GDi petrol engine is perfectly capable for urban and general use, but you’ll be aware of the lack of power when trying to overtake at motorway speeds. 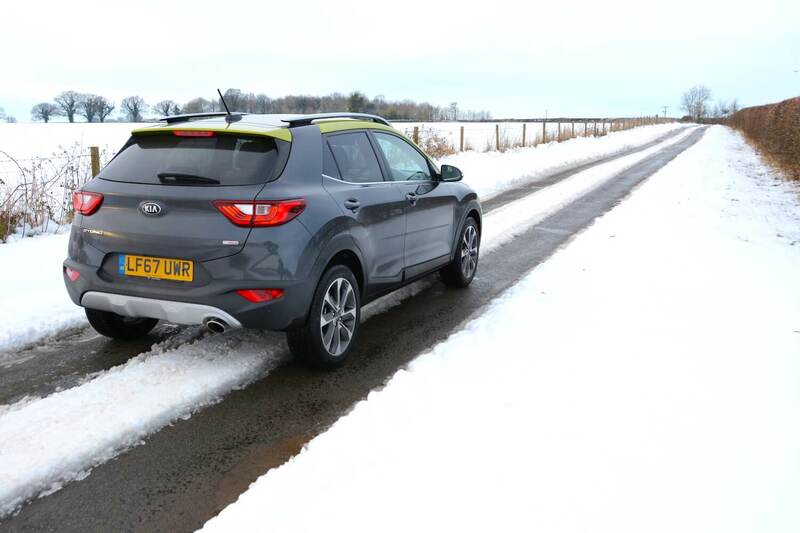 You’ll also experience the typical small triple-cylinder engine soundtrack when accelerating, although overall the Stonic was quieter and more refined than expected on the motorway. 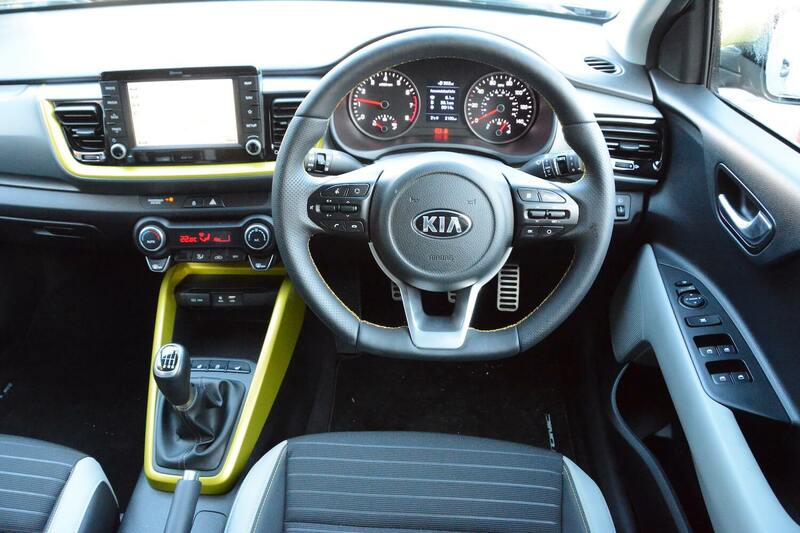 The dashboard is clear and functional, and the First Edition model is well equipped. 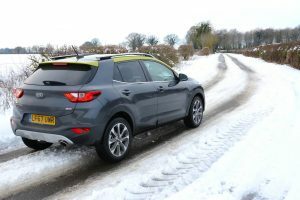 The heated seats and heated steering wheel proved to be very welcome in temperatures of minus 6 degrees, as did the easily accessible temperature controls, which unlike some rivals, aren’t hidden in a touchscreen menu. 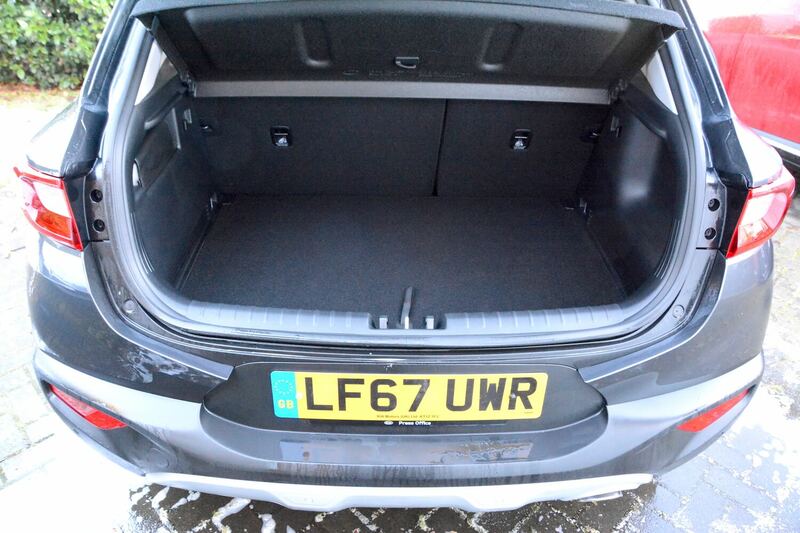 In fact Kia inThere’s also a useful reversing camera. We did experience an issue with the satnav, as it tried to take us on crazy routes a few times rather than straight down the motorway, and it also didn’t pick up a huge queue of traffic ahead of us on the M1. 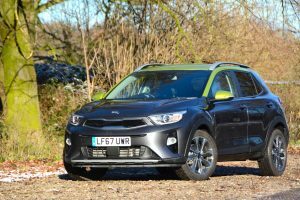 The official combined NEDC fuel economy figure for the Kia Stonic 1.0 T-GDi First Edition is 56.5mpg, which equates to 115 g/km CO2. In real-world driving we averaged 45.8mpg at 70mph, and 54.8mpg at a constant 50mph. Overall, after a week of mixed driving, we averaged 44.2mpg. 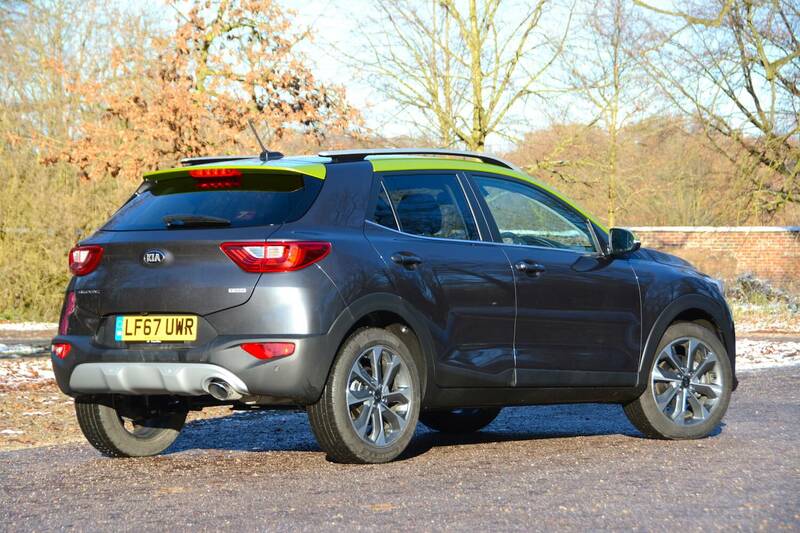 If you’re looking to buy a Stonic for longer motorway journeys rather than local urban trips, then there’s the 108bhp 1.6-litre CRDi turbodiesel which has an official economy figure of 67.3mpg and 109g/km CO2 emissions. Although the Stonic is reasonably economical, it’s worth noting that SUVs of any size aren’t the most aerodynamic of body styles (the Stonic has a drag coefficient of Cd 0.34), so if you’re looking for ultimate efficiency, don’t choose an SUV. 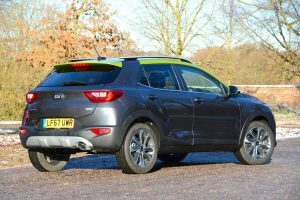 The Kia Stonic 1.0 T-GDi First Edition costs £19,695. 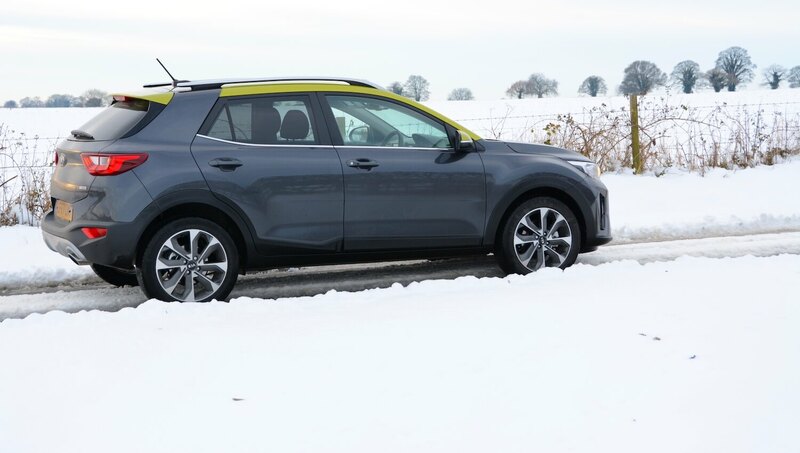 This is the top of the range model; the entry-level ‘2’ 1.4-litre petrol version costs £16,295. There’s a five-model line-up based on grade ‘2’ and ‘First Edition’ trim levels. There are three engines, the 118bhp 1-litre T-GDi turbocharged petrol unit as tested, a 98bhp 1.4-litre petrol engine (not available with the First Edition trim level), and the 108bhp 1.6-litre CRDi turbodiesel. All models are front-wheel drive and come with manual transmissions. 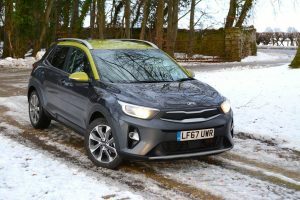 Although the Kia Stonic is based on the Rio you’d think it was a completely different car. It’s more characterful and fun to look at, to sit in, and to drive. The revvy 3-cylinder, 1-litre petrol engine of our test car helped with the fun driving experience compared to the diesel Kia Rio that we tested recently. The Stonic with this turbo petrol engine is ideal for local journeys around town, and occasional longer journeys, but the diesel engine would deliver better economy and lower CO2 for longer motorway journeys. 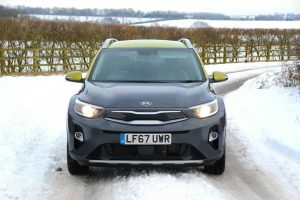 So overall the Kia Stonic is good to drive, practical, and interesting, but of course you pay a premium for a small SUV over a boring hatchback (the Kia Rio 1.4 CRDi ‘3’ Eco that we tested cost £17,245). 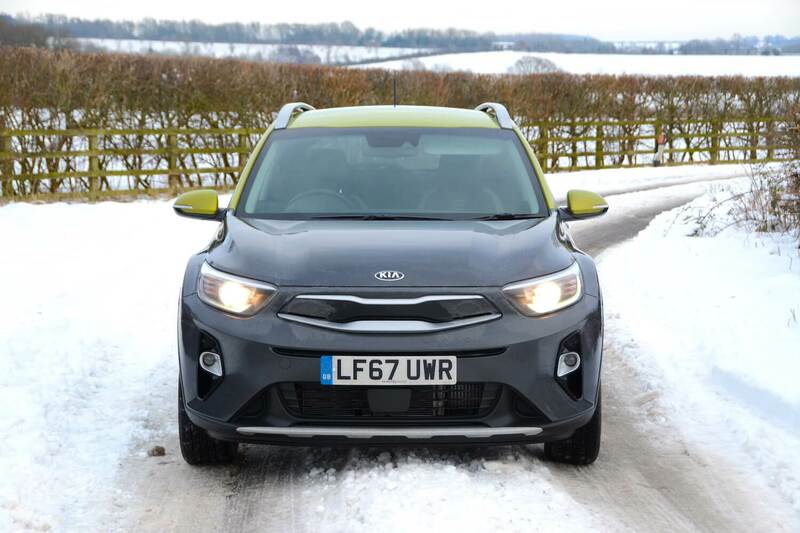 The Kia Stonic gains a Green Car Guide rating of 8 out of 10.